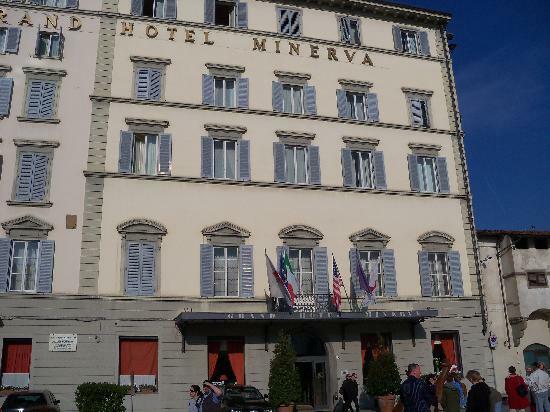 We did not at once desert the precincts of Santa Maria Novella, as we joined a party of friends at the delightful Hotel Minerva, and had our colazione at a table whence we got an enchanting glimpse of Giotto’s tower, and could watch the coming and going in the Piazza below us. With the help of these same kind friends we had concocted a very pleasant plan for the afternoon and evening, as they had ordered their car to take us to the Certosa di Val d’Ema and on to the Impruneta, whence we were to return to their delightful villino not far from Poggio Imperiale. Motor cars in old Italian towns are atrociously out of place, that is obvious to any one with an aesthetic conscience; but they are also extremely useful, and a great luxury to tired folk who ramble much on foot amid the stony streets of those same cities. We started on our expedition, only regretting the thoughtless speed of the car, which whirled us through so much we ought to have looked at and identified, even on the short way to Porta Romana. 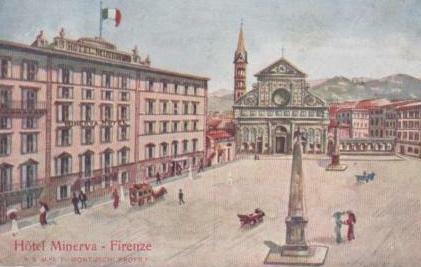 As I remarked this, L. rejoined that for his part he did not think it mattered, as our heads were reeling with all we had seen, tried to see, or had left unseen during our morning at Santa Maria Novella. We had clearly earned the right to look at nothing, and to waste our time, if we chose. The car rushed disrespectfully round by the Porta Romana and stopped first by the Cantagalli pottery works, which we had determined to visit while we had the chance. The Conscientious Objector said we had seen most of the pottery already in England, and that any we bought would assuredly arrive home in fragments, all of which was uncomfortably true. Still, certain packages did accompany us on our journey, as we fled into a charming country road, among the budding vineyards and the springing corn, and came before long to the village of Galluzzo, and thence to the bridge over the brook Ema, where Cacciaguida would fain have had Buondelmorite die ere Florence was cleft in twain by internecine strife. One May evening, in the great Dominican Church of Santa Maria Novella, I saw a striking instance of the two points of view from which she is regarded in modern days. Vespers were over; the congregation had dispersed, but a few still knelt before the altar of the Virgin, where the tapers were being put out. The light in the nave was growing a little dim, but the level sunbeams shot, arrowlike, through the jewelled windows of the clerestory, and painted their saints and angels in gold and crimson upon the stone of the opposite wall. In the raised chapel of the south transept six great candles burned before Cimabue’s majestic Blue Madonna, casting a soft radiance upon the solemn face, the stately form, the gold of background and frame. It was a good opportunity for studying a picture of which the light, and its own sombre tone, seldom permit a good view, and I sat down in a quiet corner to look and think. It is a noble picture; the work of an artist who, if not yet free from the restraining bands of Byzantine tradition, was yet striving towards movement, freedom of conception, and truth of expression; who softened by a touch of nature the stiffness which convention demanded in religious art, and whose Madonna, despite her gaunt face and almond eyes, shows a tiny hint of sweetness and tenderness, as when the brown, scented buds of the callycanthus burst through the hard branches with the first breath of spring. Down in the nave the twilight deepened; a few lights gleamed from distant altars; a few dark figures went by to the confessionals; a few Dominicans moved to and fro in their picturesque black-and-white dress. An open door gave a glimpse of the green cloister, where the sunset glow still lingered on the turf and pink roses, and where a bird sang divinely in its safe retreat. From a chapel out of sight came the voice of a priest in monotonous chant, and again and again the people’s answering cry, ‘Ora pro nobis’. From time to time a burst of organ music filled the church. A step upon the stone stairs recalled me abruptly from vague musings over the past to the realities of the present, and the ruddy face and robust, black-coated form of an English curate were presented to my ungratified eyes. He carried a flaming Baedeker, which he now consulted, and, prompted by what it told him, turned his attention to the picture above the altar. As a painting it made little impression upon him; the consideration which he gave it was too superficial to produce emotion; it probably, at this cursory glance, struck him as remarkably ugly; but, having been informed by his guide-book that it was valuable, he had entered the chapel; he would then go away and say that he had ‘seen’ Cimabue’s Blue Madonna, always supposing it to be by Cimabue and not by Duccio or somebody else. For my part, I love the story of the Merry Suburb, the jubilant city, the triumphant painter, the glad procession which streamed into the great church, too well to resign the old tradition, which is true in spirit if not in fact, and characteristic of the century if not conclusively certain of the man. When Charles of Anjou paid his visit to the artist’s bottega, when the people blew their trumpets and hung garlands across the street and strewed the way with flowers, they were welcoming, not merely a new altar-piece for the Dominicans, but the forerunner of the Renaissance, and rejoiced because the ‘Desire of Nations’, the Beautiful, was born once more of dreams and vision and much patience, before the eyes of men. The Borgo Allegri stands to this day; and if some choose to call my Cimabue Duccio or Margaritone, it troubles me not a whit. Shakespeare or Bacon, Duccio or Cimabue, what matter? The souls of men live in their works, and it is their souls and works which concern me, far more than the knowledge that one particular name belonged to a tenantless body, long since returned to dust in some Campo Santo or ancient church. ‘Cache ta vie et repand ton esprit’, wrote Victor Hugo, and this was what the majority of these old painters, voluntarily or involuntarily, did. They went through life known by chance titles, taken from the masters under whom they worked, from their native villages, or their personal qualities or defects; of humble birth, most of them, and rich only in genius and in dreams. But their works yet witness for them, and though names be blown away like leaves on the wind of time, a high title, and more enduring, awaits those who add to the sum of the world’s beauty, for ‘they shall be named priests of the Lord; men shall call them the ministers of our GOD’. To return, however, to my curate. At the Divine Mother herself, he looked a little distrustfully though without hostility; but the candles burning in her honour outraged his orthodoxy to a grievous extent. In the galleries he could look at such pictures with the same composure as at any other domestic scene. No one, of course, denied that the Saviour of the World was born of a woman; indeed, he frankly admitted as much daily in the Apostles’ Creed; but that men should burn candles before her, that an altar should be set below her image for the encouragement of idolatry, No, these things he could not countenance! His disapproval was written large upon his ingenuous red face; he cast a final hostile glance at the tapers, pursed up his lips, shut his guide-book with a snap, and clattered down the stone steps. I breathed a sigh of relief. He was doubtless an excellent young man, and I do not deny that his disapproval was entirely orthodox, but in those surroundings he was an offence to me, and I was very glad that he had gone away. There was silence for a few minutes; and then another step upon the stair. A girl this time, probably a dressmaker or servant, for she was bareheaded, and carried a large bundle under her arm. Laying this down, she kneeled upon the altar step, and gazed up at the picture, her lips moving. The candlelight fell upon the upturned, oval face, a little pinched and pale; upon the waves of black hair and the great dark eyes, which were in harmony with the wistful droop of the mouth. Why had she sought out this old, stiff Madonna in the dark chapel, instead of one of the pink-faced, prettilydressed figures in the church below, whose popularity was evidenced by the profusion of their flowers and lights and silver hearts? Was the black dress a sign of bereavement, and was that the story she was pouring out to the pitiful Mother of GOD? Or was it that she found herself far from home, alone in a great city, and wanted her mother; and, if not her own, some other mother’s tenderness, counsel and care? Or was she, young as she was, to know all the joy and suffering of women, the burden and the triumph, and was that why she appealed to the woman’s heart, which had known, also, the awe and gladness of a baby at her breast? Perhaps it was a sadder story; I cannot say. I only know that the dress was dark, the white, pleading face very earnest, and that more than one large tear splashed down upon the dusty floor. She rose at last, crossed herself, laid a bunch of violets below the picture, and, leaning forward, kissed the frame. Then took up her bundle, and, with one last look, went away down the steps. Ah, Madonna, you had indeed varied visitors at your shrine that evening! What diverse impressions and feelings must the two have carried away. And how much happier are you, with your candles and flowers in your dim chapel, than your many sisters, torn from their seclusion, and set in rows in the great bright galleries, where only the critical eyes of strangers rest upon them, and where no one burns candles in their honour, nor lays violets at their shrine. 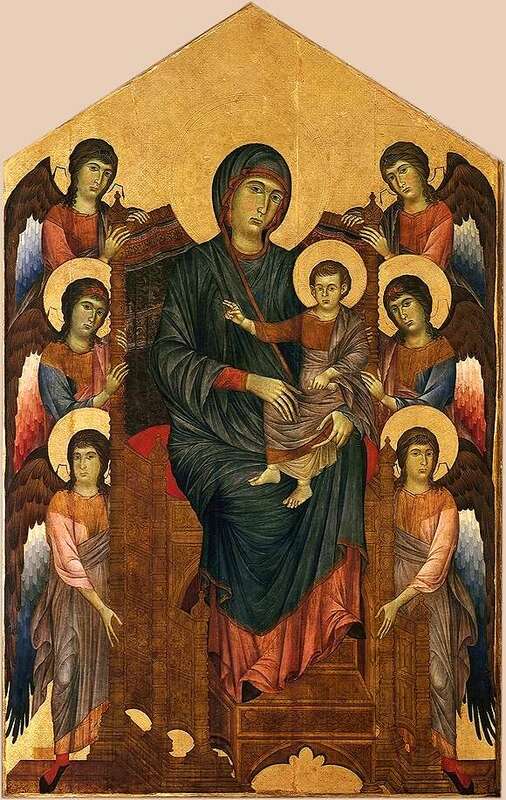 There is an intense fascination about these old, stiff Madonnas, with their sloping eyes, and grave faces and side-long gaze; not because they are beautiful, but because they were born of faith and vision, and have been consecrated by centuries of prayer. To condemn them as ugly is no less crude a judgment than to praise them as fair. They are neither the one nor the other, but they have a value and poetry of their own, and to form any just conception of their merit they should be seen in special surroundings, or at least considered from a special point of view. 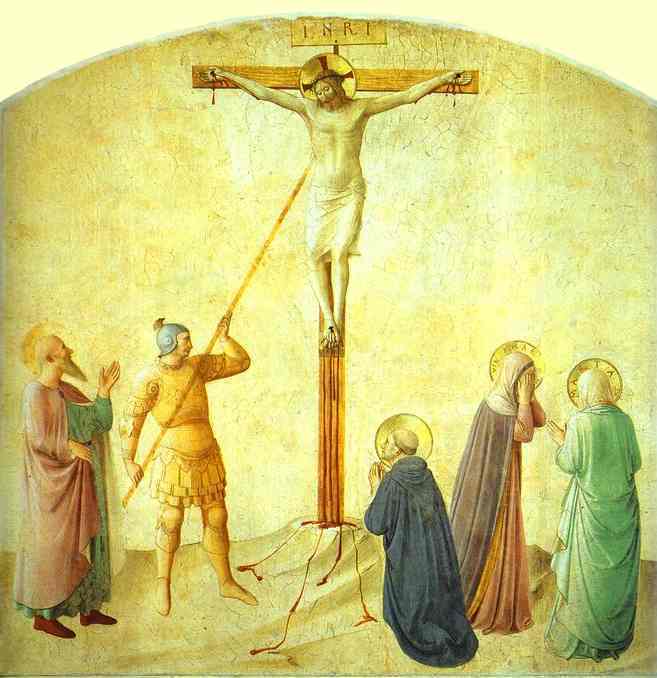 Fra Giovanni Angelico da Fiesole, whose secular name was Guido, deserves to be held in most honourable remembrance, both as an excellent painter and illuminator, and also as a perfect monk. He might have lived comfortably in the world, earning whatever he wished by his art, in which he excelled when still young, but being by nature good and serious, for his satisfaction and quiet, and also principally to save his soul, he entered the order of the Preaching Friars. There are in the convent of San Marco in Florence some choir books illuminated by his hand, which are so beautiful that nothing could be better, and some others like them, which he left at San Domenico of Fiesole, painted with incredible patience. It is true that in these he was aided by an elder brother, who was also an illuminator and skilled in painting. One of the first of this good father’s paintings was in the Certosa of Florence, our Lady with the Child in her arms and angels at her feet singing and playing. He also painted in fresco in Santa Maria Novella. He was so beloved by Cosimo de’ Medici that when the church and convent of St Marco were built, he caused him to paint in it all the Passion of Jesus Christ, with many of the Saints. They say that for the figure of St. Cosimo Fra Giovanni drew from life his friend the sculptor, Nanni d’Antonio di Banco. Below he painted St. Domenic at the foot of a tree, and in medallions among the branches all the popes, cardinals, bishops, saints, and doctors who had belonged to the order of the Preaching Friars. In these the friars aided him by sending to different places and obtaining portraits from life. He also painted a picture for the high altar of San Domenico of Fiesole, but this has been retouched by other masters and injured; but other pictures there by him have been better preserved, and there are a number of little figures in celestial glory, which are so beautiful that they seem really in Paradise, and no one who sees them can ever weary of looking at them. But beyond all that Fra Giovanni ever did is a painting in the same church of the Coronation of the Virgin in the midst of a choir of angels and an infinite number of saints, which it gives one a wonderful pleasure to look at, for it seems as if blessed spirits could look no otherwise in heaven, at least if they had bodies, and they are all so lifelike and so sweet; and the whole colouring also of the work seems to be from the hand of a saint or an angel, so that it was with good reason that he was always called Fra Giovanni Angelico. By so many works the name of Fra Giovanni became famous in all Italy, and Pope Nicholas V sent for him, and made him paint the chapel of the palace where the Pope hears mass, and also illuminate some books, which are most beautiful. And because Fra Giovanni seemed to the Pope, as he was indeed, a man of most holy life, quiet and modest, when the archbishopric of Florence fell vacant he adjudged him worthy of the rank; but the friar, hearing of it, prayed his Holiness to give it to another, because he did not feel himself apt at governing men, and said that his order had another friar, loving to the poor, learned, skilled in government, and God-fearing, whom the dignity would much better become than it would him. The Pope hearing this, and perceiving that what he said was true, granted him the favour, and so Fra Antonino, of the order of Preaching Friars, was made Archbishop of Florence, a man of such holiness that he was canonised by Adrian VI. in our days. And this great goodness of Fra Giovanni was in truth a rare thing, thus to give up a dignity and honour offered him to one whom in sincerity of heart he judged more worthy of it than himself. And would to God that all religious men would spend their time as this truly angelical father did, in the service of God and to the benefit of the world and their neighbours. Fra Giovanni was a simple man and most holy in his habits, and one day when Pope Nicholas V desired him to dine with him, he had scruples of conscience about eating meat without his prior’s leave, not considering the Pope’s authority. He would not follow the ways of the world, but lived purely and holily, and was a great friend of the poor. He painted constantly, and would never represent anything but the saints. He might have been rich, but did not care about it, saying that true riches are nothing else than being content with little. He might have governed many, and would not, saying it was less troublesome to obey, and one was less liable to err in obeying. It was in his power to hold dignities among the friars and elsewhere, but he did not esteem them, affirming that he sought no other dignity than to escape hell and attain to Paradise. He was most kind and sober, keeping himself free from all worldly ties, often saying that he who practised art had need of quiet and to be able to live without cares, and that he who represents the things of Christ should always live with Christ. He was never seen in anger by the friars, which is a great thing, and seems to me almost impossible to believe; and he had a way of admonishing his friends with smiles. To those who sought his works he would answer, that they must content the prior, and then he would not fail. To sum up, this father, who can never be enough praised, was in all his works and words most humble and modest, and in his paintings facile and devout; and the saints whom he painted have more the air and likeness of saints than those of any one else. It was his habit never to retouch or alter any of his paintings, but to leave them as they came the first time, believing, as he said, that such was the will of God. Some say he would never take up his pencil until he had first made supplication, and he never made a crucifix but he was bathed in tears.